How to find the NEW KnitTraders Blog. 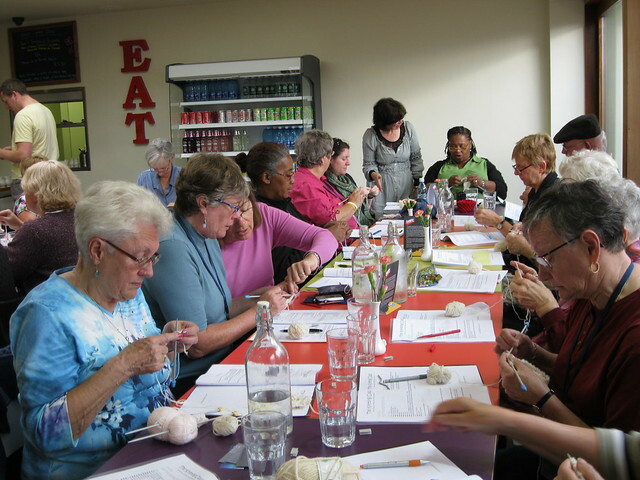 We have begun a completely new blog for KnitTraders of Kingston and will be posting class information and updates about our Knitting Tours as well as other bits and pieces that are of interest to our customers. First of all, for all of you good Catholics out there, you will recognize the slightly amended formula: "Bless me readers, for I have sinned by slacking off. It has been 4 months since my last Post." It's a simple story that, like so many other aspects of our life, can owe its origins to the internet. The fact is that for the past 15-1/2 years we have had, and continue to enjoy a wonderfully close and friendly relationship with our sister store: WOOL-TYME in Nepean, just outside of Ottawa. But as our Kingston store's internet presence began to grow we were having more and more confusion about the WOOL-TYME website, which is solely owned and operated by the Nepean store. It was embarassing to us and confusing to many customers, especially out of town shoppers, explaining how 2 such stores could exist in relative proximity to each other with the same name yet not carrying the same products nor offering necessarily the same services to their customers. So between us: Theresa de Vries - the original franchisor, and I- Anne from the Kingston store, we decided that the time had come to make things clearer for everyone by having us adopt a new name. And might I add that I love the new name, the logo and the icon which can be seen on our Ravelry pages. I can credit Alana - my long suffering and wonderful manager, for coming up with the name, and our friends at DigiGraphics in Kingston for the fine-tuning of the logo. But the down side is that with all of the extra tasks that we want to accomplish to spruce up the store with the new branding, I am sadly going to have to put the blog to bed. We will however have a blog type feel to the new website, and you can continue to follow what is going on at the store by signing up for our e-newsletter. Dublin - Part two and finale. 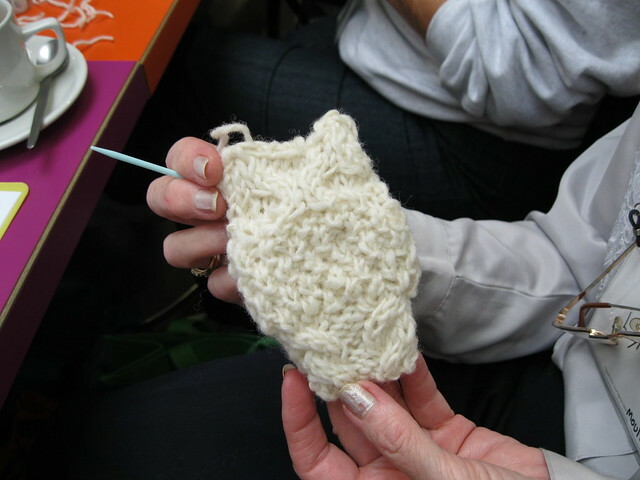 ee One could be excused for wondering if any actual knitting got done on the Irish Knitting Tour when reading these blog posts. Well the answer is that yes, some of us got a fair amount accomplished but there were also games of bridge, pints of Guinness, glasses of Jameson's, shopping and just some good ol' chin wagging that had to be accomplished as well. Here are some pictures to prove that I did take my knitting quite seriously while I was there. This is the lower body of a jacket that I'm making for my sister-in-law who turns 50 next summer. Those of you who follow this blog may remember that I have committed to knit each of my siblings and their spouses a sweater for their 50th birthday. As my youngest brother turns 50 in Dec. 2012, and he is 6'5", I decided that I would try and get a head start on his wife's sweater as his will probably take me a good long time. I also brought one of the kits that we had in the store for one of my favourite patterns: The Ridged Baktus Scarf. I chose this one because the colours were just so darn Irish. It is made of 2 different bamboo yarns and I had not have much chance to knit with bamboo. I'm loving it, and although I'm not sure what I'm going to do with this particular scarf I might just keep it as a souvenir of these 10 days on the Emerald Isle. On our last morning in Dublin Abbey Tours, who had done such a wonderful job of organizing all of our travel, had set up a fabulous workshop at Winnie's Craft Cafe with Pauline Gallagher to teach us the basics of Irish/Aran knitting through her pattern for the Oisin Owl (pronounced Osheen owl) which can be found on Ravelry. Pauline's handout has an absolutely fabulous history of the Aran sweater, showing how inaccuracies and creative interpretation of half known facts lead to a world of "Blarney". It is so good and concise that our guide, Gerry asked at the front desk of our hotel to make a copy. The front office manager was so impressed that he also made a copy for himself, as he said he was never sure what to tell people when asked about the truth about these gorgeous but often misrepresented garments. Although all of our members look like are very dilligently at work in the picture here, what you may not notice right away is the EAT sign in the back. Just to the left of this picture is actually the most magnificent array of baked goods that you can imagine, and we were all treated to a tea/coffee and traditional scone as part of the workshop. We just felt so spoiled. After all of this wonderful knitting activity everyone got to go into the store part of Winnie's Craft Cafe to do a little shopping. Marina Hand (in white) is the owner of Winnie's. An accountant who, by virtue of the recession, was forced to make some life changes and difficult choices and now finds herself having the time of her life greeting people and helping lots of young mom's and others who come in to sit at the cafe and work on their knitting projects. Meet WINNIE, the Wool Wagon. Winnie lives outside the Craft Cafe in Booterstown district of Dublin. 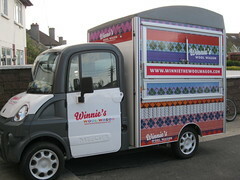 Winnie, the wagon originally came to help Marina in her effort to bring beautiful wools and other yarns to the masses in local fairs and markets. She and Marina have now found a lovely home together, serving the knitters of Dublin. Before I leave my tales of Dublin and Ireland, I must tell you of my most amazing discovery. On the first day of the tour I heard someone mention Tim Hortons. Gerry, the guide asked nonchalantely: "Oh, do you have Tim Hortons in Canada?" I couldn't understand the question, it seemed so odd. Then we discovered that "SPAR", the Irish equivalent of Mac's Milk, has a coffee service in many of their stores that is supplied by Tim Hortons. This one happens to be in the SPAR store just next to Winnie's, and having been so royally treated to goodies at their cafe, I didn't get a chance to try it, but I'm told that it's just like home. So on Wednesday evening we were driven to the Abbey Tavern for an evening of traditional Irish food and entertainment. We returned to the hotel with way too much packing and organizing to do. But all got attended to and somehow all 32 of us managed, with our guide, Gerry and our faithful bus driver, John to line up for one last group picture. I'm almost reticent to see that picture as it was such a bittersweet time of parting. It's funny. My nature and my personality is that I'm always up for the next thing. I love change, I love new things. Yet, this was a hard goodbye to a land that is struggling in the face of grave economic uncertainty with a brave and willing smile. It was an honour to have spent this time in such a wonderful land and with such a rich and resillient group of people. The last days in Dublin - part one. I've decided to share a bit more of the non-knitterly lore that we absorbed while in Ireland, and this is one of my best finds: Banoffee pie. As you can see, it is a pie formed with a biscuit crumb crust topped with Dulce de lece or cooked caramel pudding, then a layer of sliced bananas and finished off with meringue or whipped cream. It is truly a work of genius (and this from the woman who isn't even that fond of bananas). If you link to the recipe above, you will not come to the one pictured here, but I chose this illustration because it looked most like the piece that I had at Moll's Gap, an absolutely amazing gift shop and tea room deep in the heart of the Killarney National Park. The ingredients to make this particular Banoffee pie were a bit too foreign for what we could find here in Canada, so I opted for a more achievable recipe that I found on the UK Food Network. We were also told that if 2 friends meet each other, the first would say to the second: (phonetically reproduced here) Dia Gwich, or "God be with you". The respondant, not to be outdone, would say (again, take my Gaelic with about a shovel full of salt) Dia Maire Gwich, or "God and Mary be with you". A 3rd person joining the group would be greeted with the addition of St Patrick or one of the other saints being added to the list, and on it would go. As the daughter of two Cape Bretoners, I've been exposed to a fair amount of Scots Gaelic on trips to the maritimes and immediately recognized Failte as meaning "Welcome", but I'm embarassed to say that I never learned how to pronounce it. I now believe that I wouldn't embarass myself too much if I were to say "Falcha" to a Gaelic speaker who came into my store. And easiest of all, Galore simply means "lots". While planning this trip, I had made contact with members of the Dublin Knit Collective through Ravelry. We were going to join them at their regular Tuesday evening meeting at the Moda Cafe in South Dublin, not too far from the Mespil Hotel where we were staying. When they heard how many of us that there were, they offered to come to us. So at 8pm on Tuesday, October 4th, about 35 knitters swarmed the lobby of this relatively classy hotel, moving furniture, bringing in chairs from the bar, chattting, laughing and generally having a great knitting sharing session. We met Ger, Olive, Mary, Anne and many others. It was absolutely fabulous. The most amazing thing was that although we were planted right in front of the hotel's relatively busy front desk, people checking in just simply went around us, all the while trying to figure out what this gaggle of women of all ages was doing. We actually had several other women who were staying at the hotel with other tour groups, join us too. Knitting...the universal language. 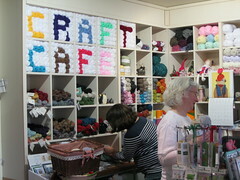 Next post will be the about the lovely time that we had at Winnie's Craft Cafe. What a home away from home. Everyone on the trip was trying to figure out how I could incorporate such a cafe in our store. In the interest of full disclosure, I must admit that I am writing these last 2 posts about our Irish Knitting Tour from home. I've been telling people that I'm being dragged back into the real world kicking and screaming, not at all ready to let go of the magic of these 10 days. Just look at this picture taken in front of the Leenane Sheep and Wool Centre. It was an absolutely stunning drive north from Galway through sparsely populated countryside. The steep hills on either side of the road (with but a mere 4" of shoulder on either side of a single generous lane) were marked with traces of "lazy beds", the completely inappropriate name for the hand built furrows in which potatoes were traditionally planted before the famine of 1845-49. As we arrived at the centre, we were met with the great news that all merchandise in the store was 20% off as an end of season clearance incentive. This call to retail action did not go unheeded. And although it was not a very sheepy treasure, I did buy myself a bracelet of silver and beautiful Connemara green marble. I love it! Patricia, our guide at the museum, gave us a great demonstration on everything from shearing to weaving the wool from local sheep. Don't you just love this magnificent piece of fabric art. It was made by a French artist for a local woolen mill from pieces of "jumpers" made by the company. When the mill closed, they asked if the museum would like to purchase the piece, and it holds a prize place at the museum's entrance. Too bad you can't see much of the detail in this less than adequate photo, but the aran fleece on the ram and the texture in the rocks can give you an idea of the detail of execution. The next day, we made one final stop on the way back to Dublin at the Strokestown Park and Famine Museum. This is a picture of Deirdre. I don't think that it's an exageration to say that Deirdre pretty much ran the whole show while we were there. As we arrived, she was working in the gift shop and setting up displays. She led us on the tour of Strokestone House, a faithful preserving of a way of life that was coming to a shabbyish end for some of the great families of Ireland in the 20th century. It was fascinating to see, not just a hint of the oppulence of their glorious past, but the sad decline as times and resources changed. After the house, Deirdre introduced us to the only museum in the Republic that houses the few remaining documents of the years during and after the great famine. What was particulary impressive was the link that was made between the conditions that led to the famine in the mid 19th century and its dire consequences, and the famines that plague different areas of the world today. Then we went to the centre's most excellent cafeteria where I had a tuna salad with real fresh tuna, that was definitely the product of false advertising...they absolutely should have noted that it was Salad For 4! Amazing. Oh, I forgot to mention that Deirdre was on the cash register in the cafeteria and then ran back to the gift shop when all were served. She was a wonder, and a beautiful one at that. After lunch I took a walk through the walled garden of Strokestown House. Since reading The Secret Garden as a child, I've always wanted to see a real walled garden, and this one is a prize. Again in keeping with Strokestown House's commitment to portraying life as it really was at the end of the era, the garden has been allowed to grow beautifully wild around the perimeter while the croquet lawn in the centre is immaculately groomed by the full time gardener. Just before leaving for the airport, we found out from our very favourite bus driver on earth, John, that we had completed 1800km of driving in the 10 days in Ireland. Now you must realize that only about an hour of that was at our habitual North American speed of about 100km/h. I figure that the distance of 1800km probably represented about 30-35 hours on the roads. That which kept us cheerful and sane were the stories that our guide, Gerry, shared with us as we passed different points of interest. History, geography, botany, geology, current events, all manner of Irish lore and a good crash course in Gaelic were what we were treated to. Gerry knew it all. So we were a little surprised when we drove through Longford later in the day and Gerry commented: "Ah, yes, the town of Longford...What can one say about it?...Not much actually." But then he remembered about a lovely young woman from the town who moved with her new husband to Chicago (I think) and had a son before they moved on the Australia. They named their son after the patron saint of the Longford: St Mel. You guessed it. Mel Gibson's mother came from Longford. Unfortunately, St Mel's church burned last year and they are in the middle of a campaign to rebuild it. You would think that it's namesake would foot the bill. The last post will cover our wonderful time in Dublin before we headed back to Canada. I'll try and get to it tomorrow, before my brain gets too pulled back in to the swing of the old life and loses touch with the magic. This was one of the days that we were all awaiting with great anticipation, the Aran Islands being the birthplace of traditional Irish knitting patterns. But it really must be said that the Aran knitting tradition must be one of the most myth surrounded types of knitting ever. We really weren't sure what to expect on Inis-Mor, the largest of the 3 islands steeped in Gaelic tradition. -It isn't too difficult to buy land on the Island but in order to receive a permit to build on the island, you have to have lived there for 7 years and be a fluent Gaelic speaker. - Unlike many of the areas of Ireland, they recycle and reprocess almost everything that can possibly be recycled right there on the island. The small amount of waste that doesn't fall in to that category has to be transported to the "mainland", which of course is the island of Ireland. - Dun Aengus is the largest of the prehistoric stone forts left on the Islands. Our guide helped us situate it in time by saying that it predated the "Braveheart" area. And there can be no question that stone is their most plentiful resource. Here are pictures of the countryside with uncountable kilometers of "dry stone walls", incredible feats of engineering whereby rocks from a field are piled strategically to create a freestanding division of fields to keep animals enclosed to protect the adjacent grazing lands. As we drove by that former pub, we were told that it was now the local KFC outlet. As for the shopping part of the journey, there were a few sweater outlets, including An Tuirne, where we met Rose (how I wish I had had the presence of mind to take a picture of her) who is one of the youngest traditional knitters left on the Island. We may have left our mark on the Aran tradition of knitting by introducing Rose to Ravelry and showing her a few of our Canadian interpretations of the Aran traditional knitting. It might be a portal through which young Aran residents can be enticed to become knitters. Down by the ferry docks there are a series of shops, including the Aran Sweater Store where Jen displays what appears to be a replica of our Block Afghan back at WOOL-TYME Kingston. We were amazed! There is no question that one has to be very careful when choosing a sweater to buy. Like in any other tourist centre, there are different levels of authenticity and quality offered in some of the shops, but without question, the real McCoy is easily available on the Island. Anyway, all in all it was a "grand day", as they would say, and we had a "good crack", mixing with folks from all over the world on the ferry and on the walk up to the fort, then lunching with the locals at Ti Joe Watty's pub , with the best seafood chowder that I have ever had. The problem with having more fun than you believe possible is that it leaves very little time to get on the computer to blog about all the fun that we're having. Here we're at Durty Nellie's pub, (est. 1620) just outside of Bunratty Castle. The unusual thing about Bunratty is that unlike most of the ruins of ancient castles and forts that we passed along the way, this is a fully restored "tower home" which shows how the family would have lived over 500 years ago. Most of the furniture is actually from that period, and unlike many curated exhibits, most of it is still in use and fully available for visitors to investigate. The concept of sitting at a 500 year old table really boggles our relatively young North American minds. Making our way towards Galway, which we will use as a base for the next 3 days, we stopped off at the Cliffs of Moher. Absolutely stunning, and the "access ramp" that was along side the 300 odd steps to the top was a bit of a joke. I couldn't imagine any electric wheelchair or human pusher who could make it up those hills. We did however see a fellow with a golf cart, which explained that what we took for a "ramp" was more likely a small track for the few motorized vehicles on patrol. Besides being distracted with exciting activities that keep me away from my blogging duties, the only other problem that we are encountering are that our guide, Gerry and our bus driver, John have completely spoiled us for any others who will ever try to fill their shoes on future tours. They have both gone way beyond the call of duty when it comes to being flexible about changing routes and plans. And add to the mix that they're both as funny as can be, well, we're trying to figure out how we can kidnap them and bring them home with us. It was particularly wonderful to have them join us for a REAL Medieval Feast in a 17th century castle where King Jason and Queen Tammy presided over the company.